Mr Lee Kuan Yew had a vision for education | Thoughts – HEY! The late Mr Lee Kuan Yew was an exceptional man. And it hit home just how much he means to all Singaporeans when I went to pay my respects to him at Parliament House yesterday afternoon. Today, we honour Mr Lee and his legacy. And it’s rewarding to see so many that have joined in for this. In less than 50 years, he and Singapore’s pioneer leaders remarkably transformed an impoverished island with no resources and a population of 2 million who were mostly illiterate or lowly educated, to a modern city-state of 5.5 million people with the living standards of First World countries. I vividly remember the day in August in 1965, when my teacher in my Swedish high school announced to my classmates and I that a new nation, Singapore, had been born in Asia. This was also the first time I heard the name Lee Kuan Yew. I never knew back then that my personal destiny would be closely tied to this fledgling young nation that would become known for its high standards in education. Mr Lee had a vision that with education, the population would be the nation’s most important assets in an island with no hinterland or natural resources. Working towards that vision, Mr Lee in the 1950s and 1960s focused on building an efficient, universal education system that would provide a skilled workforce for Singapore’s industrialisation programme as well to as to lower unemployment. Mr Lee also saw the need to build a professional teaching force and internationally competitive local universities that would put Singapore on the world map. Today, Singapore and the National Institute of Education – which is part of NTU – are known internationally for high teaching standards, particularly in the teaching of mathematics, science and reading, and ranked tops in the world. Many Western countries that adapted Singapore textbooks have reported improvements in their students’ performance. This small country also uniquely has two universities that are ranked within the world’s top 50 – NTU and our older sister, the National University of Singapore. If you consider the fact that Singapore is just 50 years old and yet has two world-class universities, you begin to appreciate the magnitude of this achievement. A key pillar that Mr Lee strongly pushed for was the bilingual policy, with English as the working language and the language of education and learning, and the mother tongue to keep Singaporeans culturally rooted. Back then, trade and industry was the young nation’s only hope for economic survival. To attract foreign investors here, he foresaw that Singaporeans had to speak English, the language of the global economy, international diplomacy, science and technology. More importantly, bilingualism ensured that Singapore’s society of many races and languages remained harmonious. Being educated in English gave all the races in Singapore equal opportunities for learning and upgrading themselves across diverse fields. It enabled them to become successful in the workplace, whether at home or abroad. Studying the mother tongue helped Singaporeans build a sense of belonging to their cultural roots and enhanced their self-confidence in the global arena. With these foundations in place, Singapore’s economy swiftly took off. From the 1970s, Singapore developed from a labour-intensive economy to a more capital- and skill-intensive country. To match industry demand, Singapore had to supply an even better educated and skilled workforce. This meant establishing more high-quality universities and tertiary institutions that can produce well-trained graduates and highly skilled workers who can contribute to Singapore’s fast-growing economy. When it came to research, water was one of Mr Lee’s favourite areas. This important molecule that we are so dependent on was one area we could become independent in. The Nanyang Environment and Water Research Institute here at NTU is one peg on the ground on this policy. Mr Lee had always given personal attention to NTU’s development. In NTU’s early days, he would actually visit the campus unannounced, typically on weekends, to observe the progress. He suggested a number of improvements such as covered walkways to shelter students from the hot sun, as he said it could get very hot walking from one building to another. Mr Lee also met with NTU’s founding President, Prof Cham Tao Soon, to share his ideas about the university’s development from time to time. 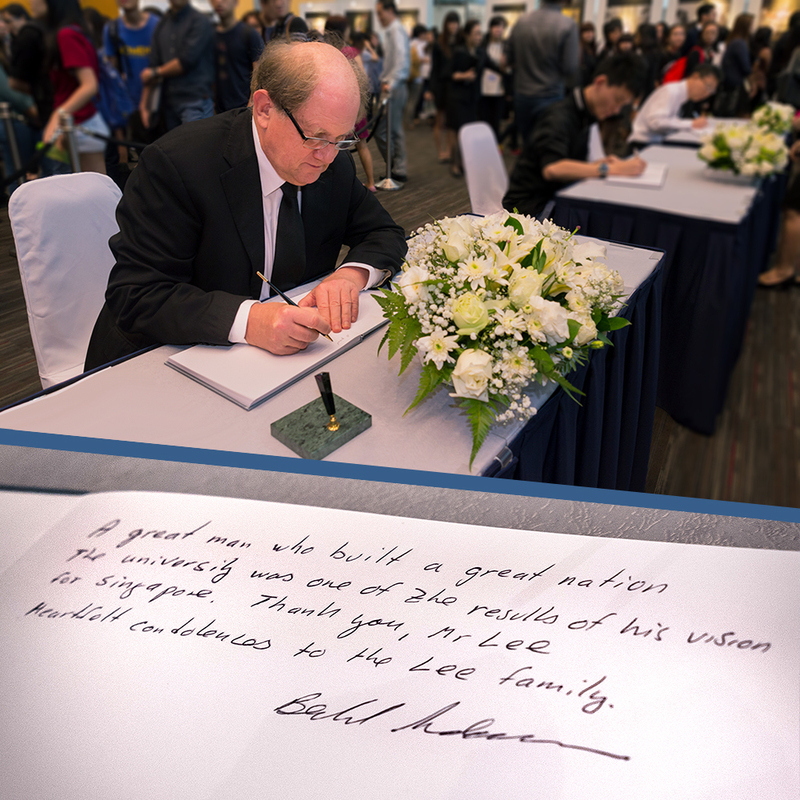 Over the years, NTU had had the honour of hosting Mr Lee on our campus on a number of occasions. He met and engaged our students at five Ministerial Forums in 1996, 2000, 2003, 2007 and for the last time in 2011. During these engaging dialogues, our students and the rest of the NTU community got to hear his ideas and concerns for Singapore’s future, and the challenges facing Singapore amidst a rapidly changing world. I heard the name Lee Kuan Yew back in Sweden in 1965, but I also met Mr Lee personally at a session with students and faculty even before I became Provost, in January 2007. He rode the bus with the rest of us as we went on a tour of the beautiful NTU campus. When we went past the iconic School of Art, Design and Media, I joked that the grass slopes are perfect for skiing except there is no snow in Singapore. He laughed at my stupid joke. I suppose he approved of me despite my irreverence because I was appointed NTU Provost soon after. I felt very privileged to have had the opportunity to speak with him on several occasions. To me, he will always be a towering figure who inspires others with his wisdom and vision for Singapore as a dynamic nation of opportunities. A very unique man, a very unique leader. Today, Singapore is a global hub of education, science and technology, trade and finance. Its transformation from Third World to First in one generation is one of Asia’s great success stories. When it comes to rankings of economies, Singapore is always among the top. This success is in no small measure due to the late Mr Lee Kuan Yew. Even as we are all saddened by his passing, let us reflect and remember his immense contributions to this country, which has made the world admire Singapore and its achievements. Let us continue his vision for Singapore to become a nation of distinction in the eyes of the world, and to foster a well-educated younger generation who will write the future chapters of Singapore’s global success story. This entry was posted in Education, Tribute. Bookmark the permalink.